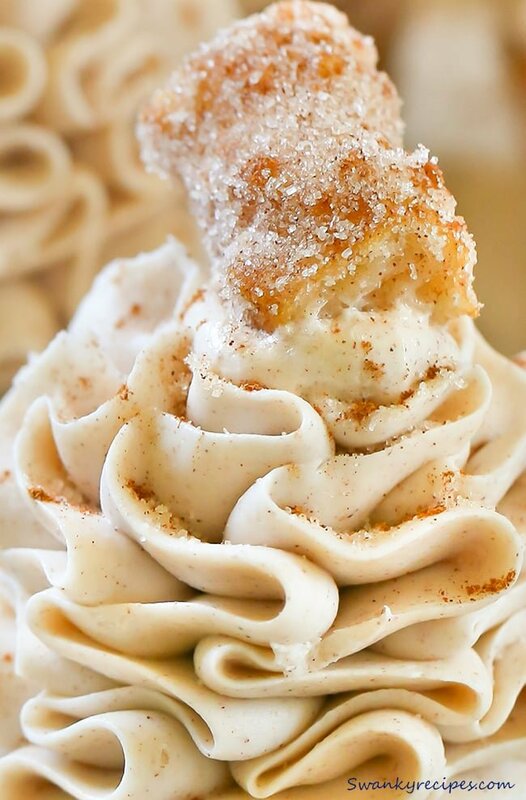 Dreamy cinnamon and vanilla cupcakes with Cinnabon Cinnamon Cream Cheese Frosting and a sugary churro on top! 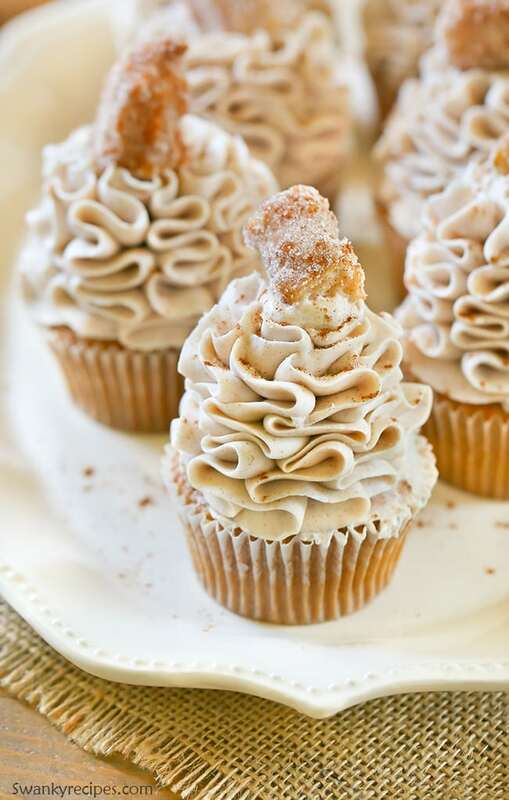 To date, these churro cupcakes are my favorite dessert yet! All week, I’ve been dreaming of a churro and I finally had to stop by El Paso to get one! I’ve had my fair share of Mexican sweets for the month, but I’ve been wanting more. Since today is Cinco de Mayo, I wanted to make something extra fun and share these amazing cupcakes. The cupcake batter is pretty simple. It starts with butter, sugar and the usual. However, this recipe uses both heavy cream and full-fat sour cream. The result? An incredibly moist cupcake that tastes better than any boxed version out there. I couldn’t make a Churro Cupcake without indulging in Churros. I just love that the first bite is the churro on top. It left me fully engaged and ready to take a lick of the frosting! Let’s talk about this frosting! It’s pretty incredible and tastes just like Cinnabon’s secret recipe. Although that wasn’t my intention when making these, it sort of worked out that way! You’ll want to keep this decadent cream cheese frosting on hand for future recipes! LOOKING FOR MORE RECIPES TO CELEBRATE CINCO DE MAYO? 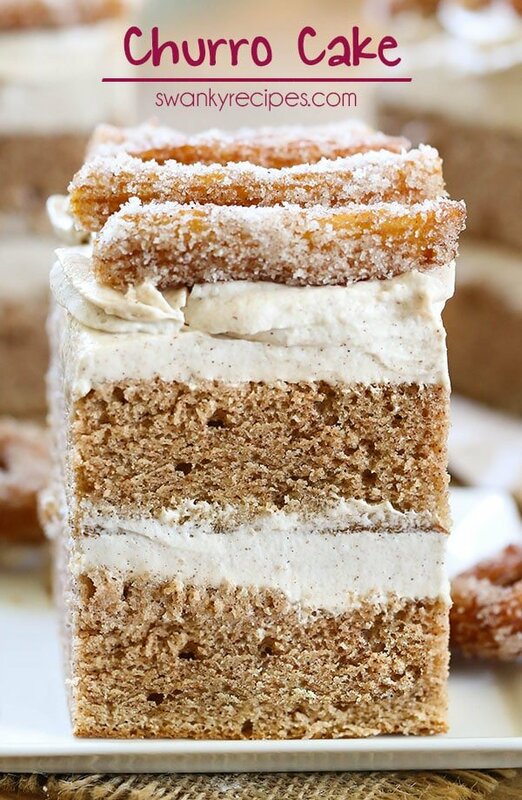 TRY THIS DECADENT CHURRO LAYER CAKE OR CHURRO FUDGE. THESE BEEF RANCH TACOS OR THESE FISH STREET TACOS ARE PERFECT WITH MEXICAN STREET CORN. 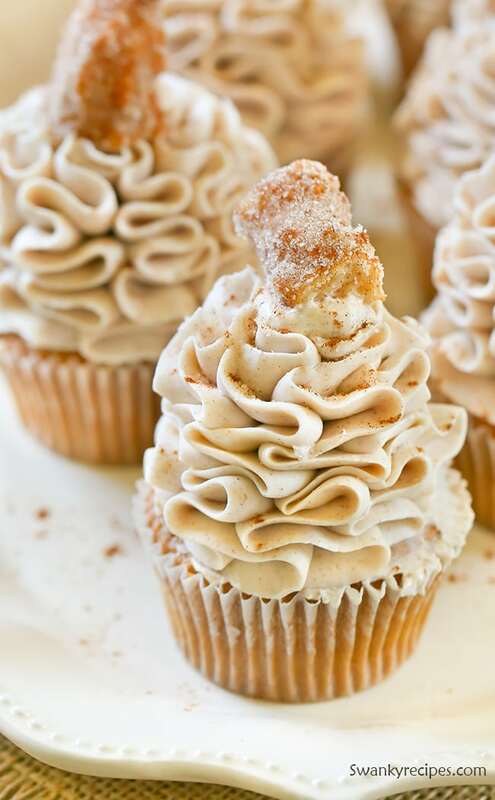 Churro Cupcakes - Dreamy cinnamon and vanilla cupcakes with Cinnabon Cinnamon Cream Cheese Frosting and a sugary churro on top! 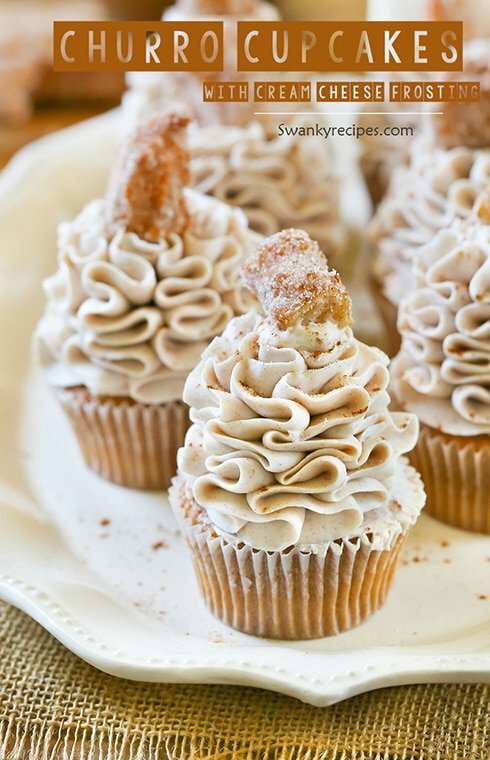 To date, these churro cupcakes are my favorite dessert yet! 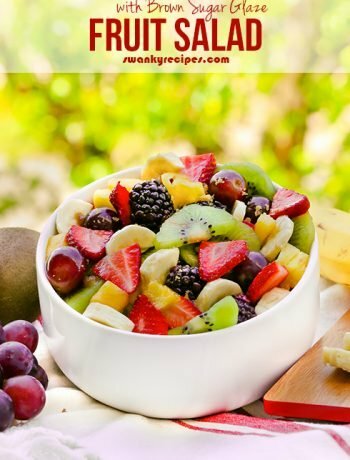 In a bowl fit with a mixer, beat sugar and butter until creamed, about 3 minutes. Add eggs, one at a time. Increase speed to medium and continue to beat about 3 minutes. Beat in vanilla extract, salt, baking soda, baking powder, and cinnamon. Scrape down the sides of the bowl and continue to beat about 1 minute. Spoon batter about 1/2 full. Bake in oven for about 22 minutes or until the center of the cupcake comes out clean with a toothpick. Allow to cool completely. Beat softened butter, cinnamon, and confectioners' sugar for 3-5 minutes. Beat in 1/4 softened cream cheese at a time. Beat in vanilla extract and a pinch of salt. Beat for an additional 3 minutes. Fill a cupcake liner bag with frosting. Refrigerate frosting for about 30 minutes. Use a cupcake tip (such as a Russian Cake Tip) to frost cupcakes. Top with a churro and leftover frosting to get it to stick to the top. **Use store bought Churro Mix (walmart/amazon) and follow package directions to make churros. Roll in cinnamon sugar when done, then cut into small pieces. Churros can also be found at most Mexican restaurants already pre-made. OMG Jessica These look AMAZING. My kids would devour these as would I. 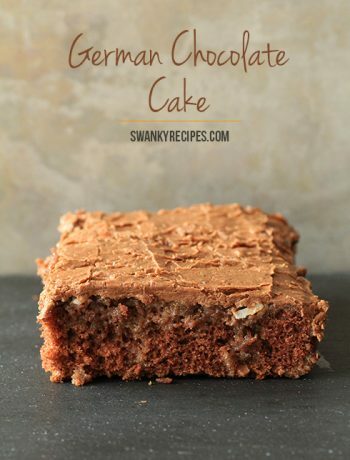 Definitely on “MY TO BAKE” List. Oh my that is super duper gorgeous, i m lost of words to describe the beauty. i m literally salivating as i read thru the description of these cute cupcakes!!! can;t wait to try them! My son peeping into my computer asks me to make these. These cupcakes do look gorgeous. You have taken some really good pictures. They are sharp. Made the Churro Cupcakes earlier today, they get 5 stars !!! The icing was excellent. They are gone. I love these – they sound amazing and look gorgeous!! I am sharing them everywhere! Thank you! These are so good!! I love churros, so I tried them , I cut the sugar in half only because I can’t deal with too much, turned out perfect!! I made these for a Fiesta themed birthday party. They look amazing, it is hard not to eat one! I did try the frosting and it is delicious. My family and coworkers love this! I try something new at least once a month this has been their favorite. They’ve asked me to bake this 3 times now! Yay, always love to hear when others love homemade baked goods! Thanks for sharing the news, they really are delicious! They should be fine during that time frame. My only concern is that the frosting might not hold up to the heat while they are out. Perhaps try a a basic frost on the cupcake since it may collapse. Frost the day before and refrigerate or day of. 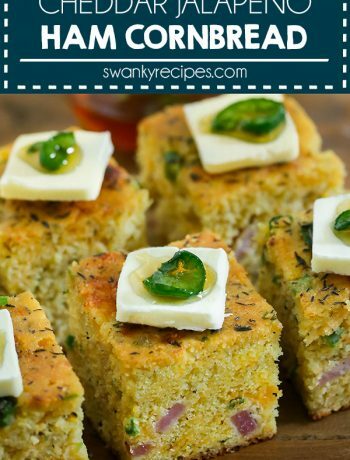 I have a big Cinco de Mayo party Saturday and want to make these ahead of time. Can they be stored for a day? Yes, make cupcakes and frost then place in the refrigerator for a few hours, until frosting is set. Then, cover lightly with plastic wrap. Only make churros day of serving and place on cupcakes. What kind of tip did you use? These were pretty good, but baked much faster than I expected, and my oven is usually pretty on point. They were a little dry as a result. Still good! However, I would recommend halving the frosting recipe. I had waaay too much, and it was a huge resource sink unless you are truly going to pile the frosting high enough to double the cupcake height.